RV Air Compressor Review – Avoid Pitfalls! My very first RV purchase once we finally received ours (the 2019 Leisure Travel Corner Bed was one year on order) was an air compressor. I think it’s the most essential RV accessory. A couple reasons. First, maintaining proper air pressure is extremely important. It will have an effect on the safety, handling, and tire life obviously. The other reason though, is that some RV’s (like mine) don’t even have a spare or any easy way to mount one. So in my case even a slow leak in the middle of nowhere could result in some pretty severe travel disruption and headaches I’d rather not experience. So the air compressor, besides allowing me to topoff the pressure when necessary, could mean the difference between being delayed or not. Of course, for topping off, you could use public air like at gas stations. I detest those though. More often than not, the air chuck will not fit my inner dually, or is just crappy and won’t seat right. Often you are going to have to turn around your rig to do both sides. Another consideration is to just use one of the many “el-cheapo” 12 volt air compressors you see on Amazon. They work, but from past experience are loud as hell and take forever (like 20 minutes per tire!) to add any serious air. Some will work at my tire’s recommended PSI (61) but the drawbacks are pretty severe. The is the cadillac of RV compressors according to most of the people who have owned them. They have a bunch of models, but this one is the continuous duty one that can be used to blow up truck tires literally all day and comes with all the accessories. Now, the bad news is, you have to open the hood and clamp on for power. The kind of amps it pulls cannot be had from a cigarette lighter plug. Although they tell you the engine has to be running, most people use them for occasional use with the engine off and it works just fine. The other bad news is, it’s REALLY expensive. So, this little guy was just about the smallest “garage” style compressor I could find. It runs off regular 120 volts which has its pros and cons. For me it was a better solution. A lot of the time while using it I am going to be parked and have hookups. In an emergency I can use my generator. As a bonus since it has a small tank you can also use it to shoot a few trim nails or something from time to time. It actually only weighs a little more than the VIAIR. 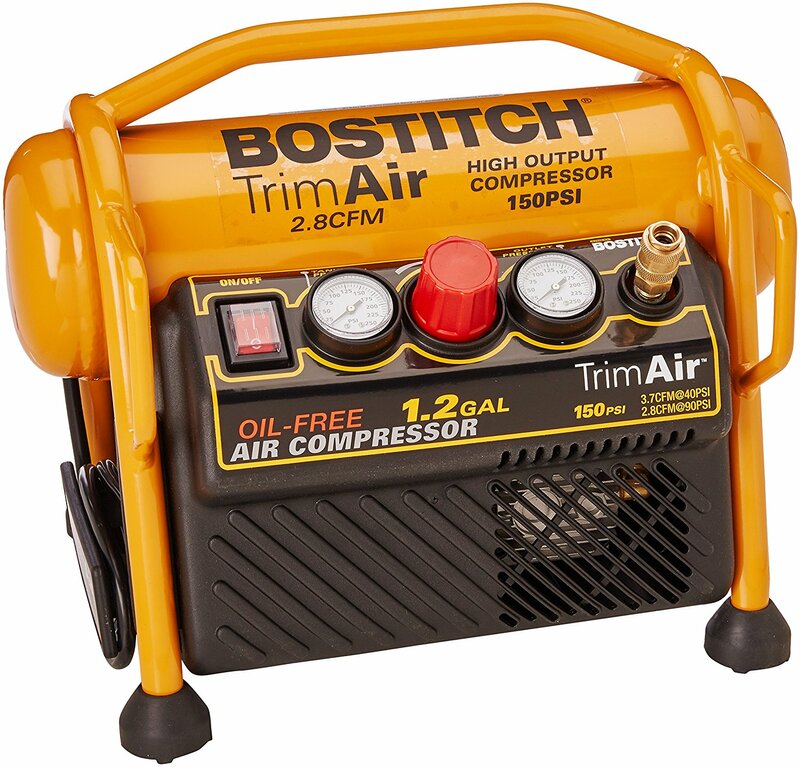 WIth the Bostitch though, it doesn’t come with anything, so I still had to buy the air hose, an inline gauge, and a dually chuck which could reach all wheels. To complete the kit I popped into Home Depot and picked up a couple standard 1/4″ inch air connectors to put it all together. This way you also end up with something useful you can keep in your garage while the RV is not being used! 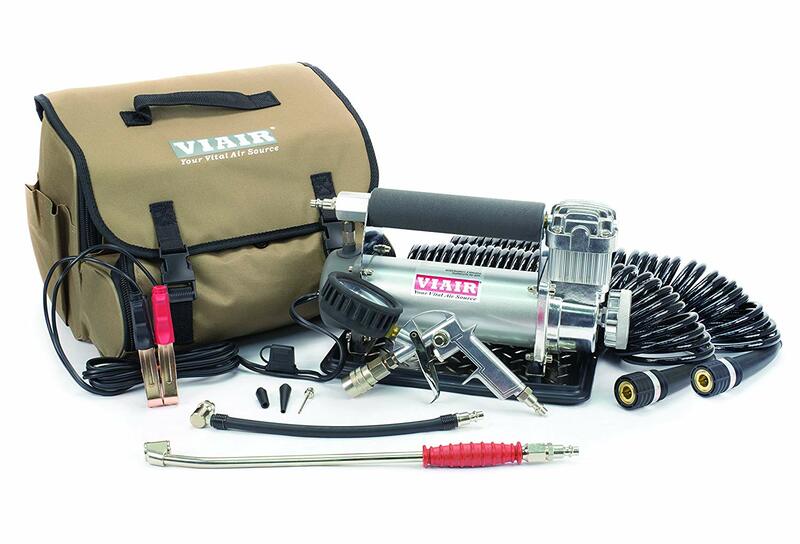 Here is a recap of the products I recommend: With the VIAIR you get everything in a kit. WIth the Bostitch I ended up actually buying (love it so far) I had to put together an air hose with the inline gauge and add a dually chuck set to get a smooth one handed fill/bleed operation on all 6 wheels.